Product information "HAIX Certified Orthopedic System"
HAIX® inlay soles comply with the description contained within Rule 112-191 of the German Association of Statutory Accident Insurance Providers (DGUV) and with Austrian Standard ÖN-Z1259-2012. The HAIX® CO System comprises a robust green foam material with a resistant cover bearing the HAIX® Logo Design. This prefabricated foam can be used for shoe sizes up to EU 51 / UK 15. 100 % polyester fabric to provide moisture distribution. The way in which these fibres distribute the foot moisture results in a faster drying effect. Open-cell PU foam offers high moisture absorption properties and excellent shock absorption over the entire sole area. 1. EVA blank approximately 40° shore A – for safety and work shoes subjected to normal use. > Cost savings of approximately 60% for the prescribed components – the expensive use of antistatic or ESD-capable materials (such as EVA or adhesives) is NOT NECESSARY as long as the instructions supplied regarding the conductive strip are followed. This means that you can arrange for your inlays to be produced in the most cost-effective way possible. > Modern cover featuring the HAIX® logo design. > Open-cell PUR foam ensures total comfort of wear. 1. 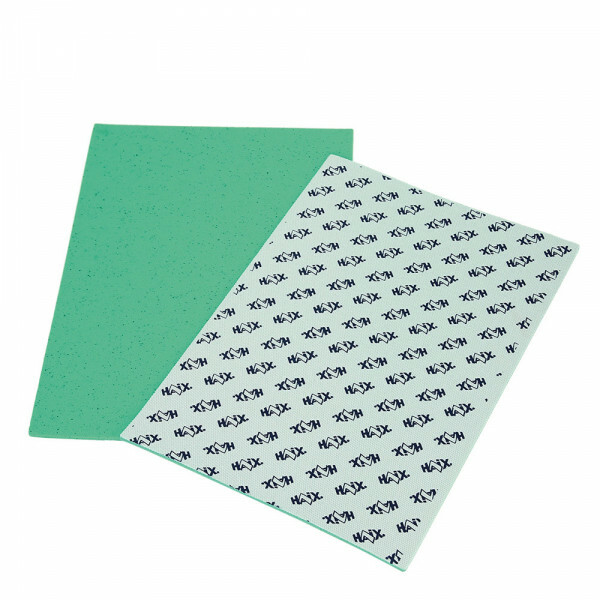 High quality foam mat suitable for UK sizes 3 – 15 / EU sizes 35 – 51. Summary: Certified HAIX® shoes with orthopaedic inlay sole “HAIX® CO System” and/or outsole raising.